So I may have a thing with naming my re-enactment stuff. My long axe is Damage, my sword is Audrey, and now my loom is called Agnes. 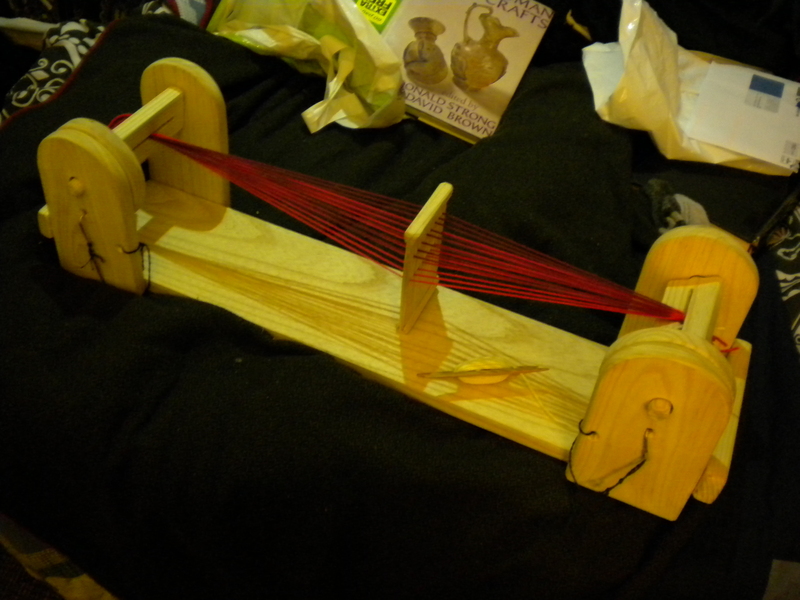 She’s not a full-sized loom, but is designed for doing heddle or tablet weaving to create braids. The society I’m involved with has a dire shortage of braids (and after experimenting, I’ve decided the profit margins for selling braids are insane), so hopefully this will help solve the problem! Agnes is made by the wonderful Lucy the Tudor, and is made so you can weave (or ”loom”, as it has come to be called in my house) braids on your lap whilst you do living history. So you do your normal heddle/tablet weaving, but wind the braid across so you don’t use so much room. With the Great British weather as it is at the moment, that’ll serve well in the probably wet summer. The next stage is now decorating Agnes so it’s definitely mine – another member of the group has one, and it would be a good idea to differentiate them. I’m also going to make a little bag for the heddle, beater and shuttle so I don’t lose them in between projects.